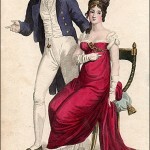 La Belle Assemblée, July 1809. 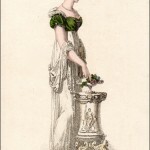 The description calls this “The Elvira Dress.” I have no idea who the Elvira was who inspired it. If anyone has a guess, let me know. 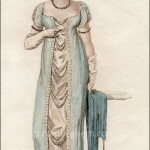 Though this is a very elegant dress, it appears somewhat matronly, perhaps due to the low waist of the short jacket. It would be interesting to see what the dress looked like without the jacket, though the jacket seems to be an integral part of the ensemble. 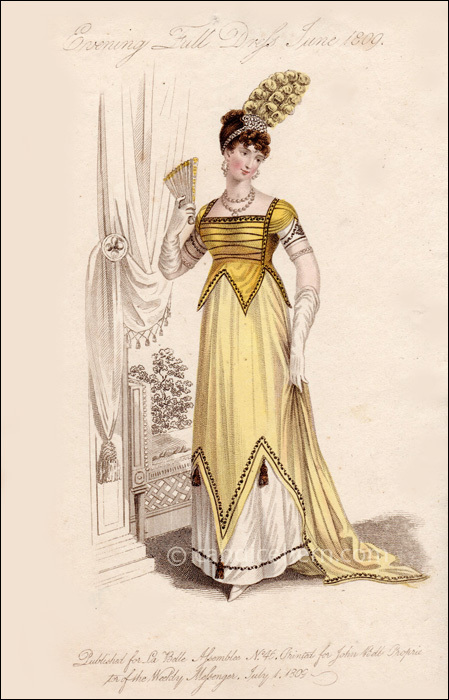 The description does not mention the headdress, which appears to be a diamond bandeau with a large yellow plume. Pretty spectacular!